For many years, I searched for a way to heal the wounds left in me by some experiences tied to the civil war that El Salvador suffered for 12 years. Life led me to Focusing, and since I started my training in 2009 with Beatrice Blake, a strong need arose in me to share what I had learned. With time I realized that I wanted to share it with women in communities that don’t have a lot of access to things, especially to tools for healing their wounds. In 2010 my mother and I started giving introductory workshops on Focusing and Nonviolent Communication to community groups in the country. My experience since then has been of constant growth. We work in communities that were gravely affected by the war, and that in this moment are in extreme poverty. The solidarity of the international Focusing community has made it possible for our Resilience Circles to reach women, children and youth, free of charge. WHO IS TEACHING AND WHO IS LEARNING? I have learned two great lessons from working with community groups. The first lesson has been to recognize that it is easy to forget the fundamental principle of Focusing: we need to respect each person’s process. 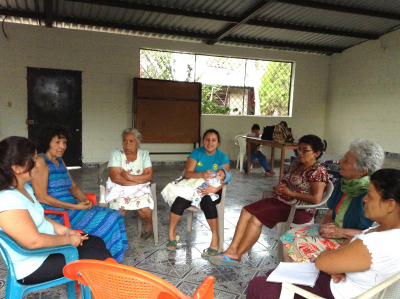 One day after a session with a group from a community called Buen Pastor, I was left with the feeling that I had wanted to give the women something they didn’t have, following the traditional teacher-student pattern. I heard a small voice inside that asked: “Who is teaching and who is learning here?” I realized that with each class, I wanted to follow a plan that I had established so that they could learn; but as it should be, these women had completely different experiences and different learning rhythms. I decided to stay a moment with my felt sense and I found a place that gave me a new understanding. From there I could appreciate the small steps that each of them was taking, and I could remember that my job is simply to give them space so that they could find their own path to themselves. But not only did I see that. I understood that I had been doing the same thing with myself! I wanted to follow a rigorous plan that I had set up in order to arrive at my intended objective. It’s incredible that our state of being is reflected in the different activities of our lives! Focusing has given me the key to become aware of these small details and to make fundamental changes in my life. I hope that as I make these changes I can help the people around me to be motivated to want to make them too. The second lesson I learned was that each person has his or her own answers, and that if we stay a moment with ourselves, the body speaks to us. In Buen Pastor, we did an exercise that I learned from Harriet Teeuw, who works with Children Focusing in Holland. This exercise helps to form a body connection through the senses. The directions were to draw an outline of a body. Each time the women experienced something with their senses, they were to express their experience with colors on their drawings. I had decided to use this exercise because it seemed like a simple, fun and effective way to connect with the body, and because it helps prepare us for inner work. Some of the women did not want to express their experience by drawing. I felt frustrated and sad at this, but I continued the exercise to see what would happen. At the end, I asked the women if they wanted to share something. I was surprised by what they shared, because I didn’t expect it. One of the women who had not wanted to draw asked to speak. She said that it was difficult for her to do the exercise because she is not used to having the time and space to stop all the things she does, like planting crops, taking care of her children, and attending to her husband, in order to feel things in this way. Another woman said she had been uncomfortable with the exercise because it was like being a child again. After listening to all of them, I reflected back some of what each one had said. It was clear that each person had found something, each in her own way. There was also the recognition that they are so submerged in their responsibilities and ways of living that this was not something that they normally do. But it seemed that each one could recognize in herself a small pathway to her inner world. It was incredible that by just paying attention to their senses, they had noticed subtle feelings and colors that, even though they had not expressed them on paper, were very clear in their hearts. Over time, small discoveries and awarenesses have resulted in fundamental changes in the lives of these women. I can see it when one of them says that she was tired and so she decided to sit down for awhile in the hammock and drink some water, or when one told of a time she had a fever but had to go to the market--she gave herself the gift of resting for awhile and looked for an alternative solution. It seems like these are small things that we should do by default, but for these women who feel the weight of holding their families together, resting is not an option. From my point of view, this is an important change in the way they live their lives. As the group continues to meet, the women are learning more and more how to use this inner pathway. For example, a few weeks ago, my mother, Melba, had led the group of 7 women in Clearing a Space, and they had divided into pairs to Focus when my brother, who helps with childcare, ran in and said that one of the children had fallen on his head and was bleeding. Melba, a former medic during the civil war, went to the boy and checked his wound and called his mother. I drove the boy and his mother to the clinic in Aguilares. Obviously the women were shaken and worried about the boy. While we were at the clinic, Melba led the women in breathing and going inside, inviting them to give space to all that they sensed there, accompanying it, and being open to what could come next. Here are some of their comments. "Being with my fear made me more peaceful." "I felt very nervous. I realized that I had connected this upset with another, older fear." "I felt scrambled up inside. I accompanied my fear and I feel much better." "It is very healing to be with what we feel. If we don't deal with what we feel, it it can ruin our minds and bodies." "I felt good being with my fear. This tool helps us, because we can go crazy not paying attention to what is going on inside." They were putting their ability to Focus to the test in an emergency, and it was working! The little boy returned from the clinic with a few stitches. He was fine. This is not the first time that we have responded to an emergency situation in the village. Teaching Focusing and Listening really brings us in touch with the pulse of the community and we do what we can to respond. My learning process has been possible thanks to the effort and work of Beatrice in El Salvador and thanks to the Focusing Institute, which gave me the Janet Klein scholarship in September of last year to the Advanced and Certification Weeklong at the Garrison Institute in New York state. It permitted me to deepen my learning, to get to know the Focusing community, and to value the work that Beatrice, my mother and I are doing in the communities of El Salvador. Little by little, we have found a way to reach children and youth as well as women. For that reason, René Veugelers and Harriet Teeuw of Children Focusing in the Netherlands are raising funds to bring one or two Salvadoran Focusers to their training in Friesland from July 14-20, 2013. If you would like to help them in this effort, please contribute in euros. We have been able to realize this dream of sharing the benefits of Focusing because of to the support of the international Focusing community. Thanks to your solidarity, we have been able to give Focusing without cost to people who otherwise would not find it. Your donations are essential for the continuation of our work in El Salvador. Please make a tax-deductible donation through TFI or, if you need to use PayPal, at http://www.gofundme.com/Focusing-El-Salvador. Yara Gabriela Jiménez, 31 graduated from Ave María University in Nicaragua with a degree in Foreign Relations in 2008. She started studying Focusing and Nonviolent Communication with Beatrice Blake in 2009 and became a Certified Focusing Trainer in 2012. She was awarded the Janet Klein scholarship to the 2012 Weeklong by The Focusing Institute. She works in the Transparency Department of the Ministry of the Presidency of El Salvador. Contact her at yaragabriela@gmail.com.